Human skin is pretty dang amazing. It protects our insides from the outside, can heal itself after a lot of trauma, and even lets us feel the world around us. It’s so complex that creating an artificial version has been virtually impossible. 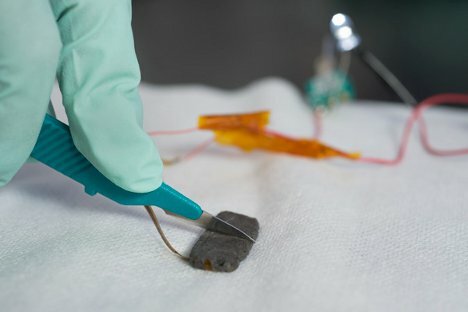 But a team from Stanford’s chemical engineering department has become the first in the world to create a self-healing material that is also pressure sensitive – and, for good measure, it’s also conductive like a metal. The material is made of two ingredients that allow it to perform its amazing feats. First, a plastic consisting of long molecule chains that are joined together by hydrogen bonds. The molecules can be separated easily, but when they are put back together they re-form their bonds easily. Nickel nanoparticles make up the other part of the recipe. The nickel increases the mechanical strength of the material while making it conductive, which is important for making the material pressure-sensitive. Amazingly, the polymer can be sliced with a scalpel and then pressed back together, and within seconds it will heal itself to around 75 percent of its original strength. After 30 minutes, the restored strength is almost 100 percent. The slicing and healing can take place over and over in the same location with no significant loss of function. 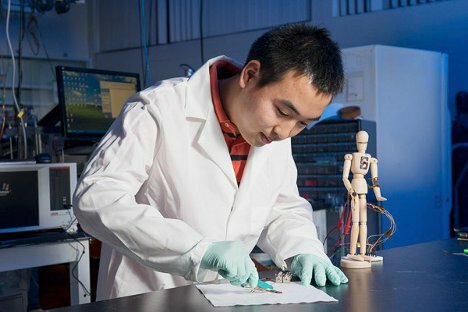 As for the future of the material, the researchers expect it to be useful in next-generation prostheses. It could even be used as a protective coating for electronics, provided the researchers are able to make it stretchy and transparent. See more in New Materials or under Science. November, 2012.